Analytics Edge is working on a new solution to simplify the tedious activities in the setup, configuration and day-to-day management of multiple Google Analytics accounts. If you manage multiple clients’ GA accounts, this connector will dramatically reduce your setup and maintenance efforts. Still in the early stages of development, the preliminary (beta) release of the GA Management Connector provides a simple point and click interface to create, modify, delete and copy Google Analytics filters. Perfect for maintaining all your accounts! Real people use long filter expressions, and that’s why Analytics Edge lets you see all 255 characters that you can pack into the field. A simple interface lets you review, edit, save or delete all your filters from all your accounts — even with multiple logins. When you’ve got it just right, apply it to all the views you want, even across multiple accounts. Analytics Edge takes care of the technical aspects for you. 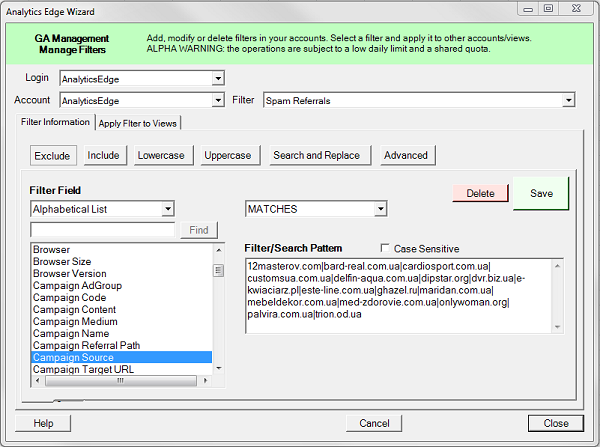 Easily keep your filter definitions in sync across accounts. The Analytics Edge Connectors for Google Analytics are available from either the Analytics Edge Basic Add-in or the Analytics Edge Core Add-in. This connector is included with the Google Analytics Pro license starting in 2018.